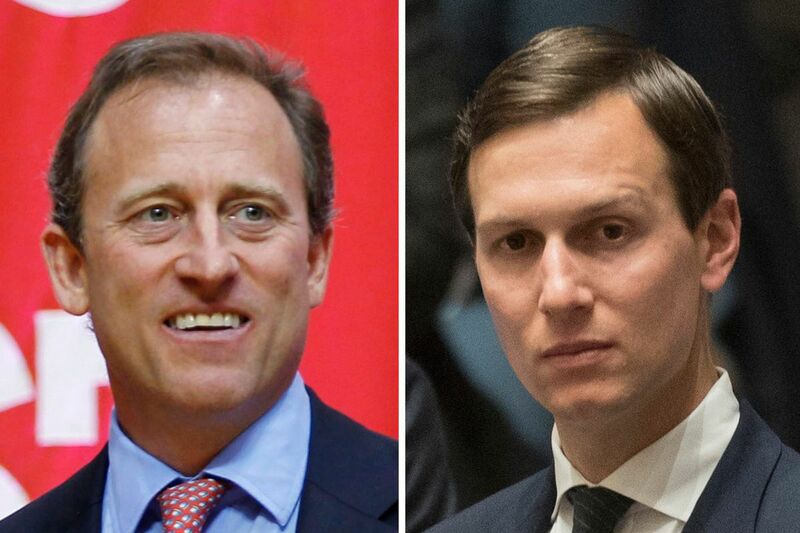 Sixers owner Joshua Harris (left) reportedly met with Jared Kushner at the White House before his private equity firm, Apollo Global Management, offered Kushner’s private business a $184 million loan. Sixers owner Joshua Harris, last seen by fans during the broadcast of the Sixers-Bulls game last week, has found himself involved in one of the latest negative reports coming out of the White House. According to a report by the New York Times, Harris met at the White House multiple times with Jared Kushner, the son-in-law of President Trump, as part of a role advising the administration on infrastructure policy. "The two of them are discussing a number of things, including a possible job for Mr. Harris," New York Times reporter Jesse Drucker, who broke the story, told Rachel Maddow on MSNBC Wednesday night. "And the job doesn't materialize as it turns out, but something else does." Following the meetings, Apollo Global Management, a private-equity firm founded by Harris, reportedly gave a loan to Kushner's private business, Kushner Companies, totaling $184 million. Drucker said the exchange could be a potential ethics issue due to Kushner's decision not to divest completely from his private businesses when he took on an official role in the White House. "It's both a very large loan by the standards of Kushner Companies, and an enormous loan by the standards of Apollo," Drucker said. "We have no indication that they discussed the loans… What we know is he discussed a White House job with Joshua Harris, and that on its own raises concerns about the subsequent financial transaction between Kushner Companies and Apollo." According to the Times, Kushner Companies also received a $325 million loan from Citigroup in March 2017, after Kushner met at the White House with Michael Corbat, the CEO of Citigroup. "Rules or no rules, let's pull back to the 1,000-foot level and ask ourselves: Does it seem like a job as Assistant to the President should be for sitting in the White House across a table from bankers that your cash-strapped family is desperately plying for a $184 million loan?" Walter Shaub, the U.S. government's former ethics chief, wrote on Twitter. A spokesman for Apollo told the Times that Harris had no involvement in the company's decision to loan money to Kushner's private business, adding that the loan "went through the firm's standard approval process." Apollo didn't immediately respond to a request for further information. Abbe Lowell, Kushner's lawyer, didn't deny that the meetings took place. A spokeswoman for Kushner Companies denied that the meetings played any role in securing the two loans. "Stories like these attempt to make insinuating connections that do not exist to disparage the financial institutions and companies involved," the spokeswoman told the Times. Harris, a graduate of the University of Pennsylvania, purchased the Sixers for $280 million from Comcast-Spectacor in 2011. In addition to owning the Sixers and Apollo Global Management, Harris is also the principal owner of the New Jersey Devils, and owns an 18 percent stake in Crystal Palace, a soccer club that's part of the English Premier League.